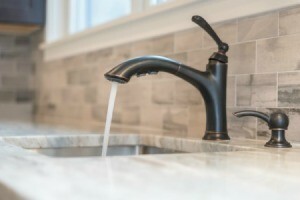 If you have a bad smell coming form the water in your faucet, it would probably be a good idea to get the water tested. A smell coming from kitchen faucet is usually a sign there is a problem with the water source or pipes. For the past two months our kitchen faucet water has started to smell like decayed organic matter. It tastes funny too. But it happens for only the first 15 seconds or so. We use the water after we let it run for first 15 seconds. We also checked all the other taps in our home, but none of the other taps smell. We have had many plumbers come and check our water softener, water heater, and pipes. Nothing came off it. We called the county too, but they cannot help since no one in the neighborhood has complained. It looks like it is a highly localized problem only in our kitchen tap. We changed our tap too, but the smell persists. What could be the problem? Is there anything else we can do to help solve the issue? Any chance your dishwasher might be the source. Perhaps food has gotten trapped and needs to be cleaned out. If it's not food trapped in there, it could be stale water in the dishwasher lines. Run one of the cleaning packets in there. There is a strange detergent/chemical smell coming from the water from our kitchen faucet. The faucet is 6 months old and this has been going on for about two weeks. We have tested the faucet in every other sink in the house. No matter where we try, the water only smells when it comes out of this faucet. It is also coming out very bubbly. Both the smell and the bubbles/foam go away after it runs for a few seconds. It is worse the longer between uses. Any ideas? Why would there be a smell to the water coming out of my kitchen faucet, but not any other faucet in the house? I had the same problem, but it was only on the side that had my garbage disposal. So I had to put my hand down in it to see if something was on the sides making that smell. Yep, that was the problem. Right under the rubber cap on the inside of the disposal there was a black scum. Apparently when you put food in the disposal and grind it up, it slings some of the juices up and it stays under the rubber glove. I took a grapefruit from our tree, cut it in quarters and rubbed it on the sides and under the rubber glove in the disposal. That did it. The acid broke down the grime and the smell went away. You can also use oranges. Now about every month I repeat the cycle. This is a good recipe for use in your drains and disposer too, it cleans and deodorizes as well. Mix together about 1/2 cup salt, 1 T. of cream of tarter, and 1/2 cup baking soda. Pour this into the drain, followed by about 2-3 cups vinegar. Warning: It will foam and bubble a lot. After the foaming stops pour a pot of boiling water down the drain. I had the very same thing, smell from faucet (not the drain). It lasted about 2 weeks. Turns out it had to do with the water supply. Just another reason to get a water filter! We've had an under the counter water filter by NSA for years. Does a magnificent job. Badly needed because the water here varies between "not too bad" to "plain awful".